One thing I love about spending time on the coast is the surprises. I can never quite anticipate what I might hear or see or run across next. Sometimes it’s spotting dolphins from the bedroom balcony, or running into the lady at the post office who has two Mallard ducks in a pet carrier on the back of her bicycle. Sometimes it’s seeing the grim reaper waving his scythe at you from the side of the highway to protest the war. Or maybe it’s watching several kites with lights soar over the beach at night, and knowing someone out there is bound to call the local TV station and claim they’re seeing UFOs. But finding the flowers on our way to the dump was one of my favorite surprises. Like all of you, we accumulate things. Because our place here is small, we have to weed out periodically, pack everything in the back of the car and head to the dump. Ahem – the recycling center. Not surprisingly, the dump is out in the middle of nowhere, down a long, long road thickly lined with poplars. So we were tooling along, doing our duty as responsible citizens, when off to our left we saw something that made our mouths drop open. There, glimpsed in picket-fashion between the trees, were fields of flowers. I’m not talking about ditch lilies or dandelions, either. 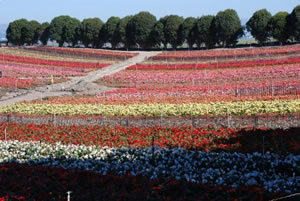 I’m talking about farmers’ fields thick with plants in full blossom. Big fields, longer than four or five football fields, and running off toward the horizon. Dodging whizzing garbage trucks, we looked for a wide spot at the edge of the road and screeched to a stop. There, just beyond the poplars and a chain-link fence, were more flowers that I have ever seen in one place in my life. 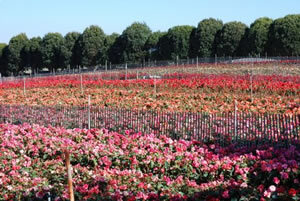 They were Begonias, I think, though we couldn’t get close enough to be sure. 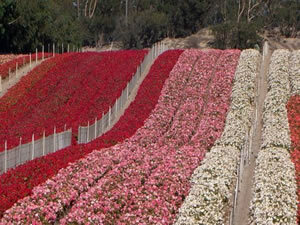 The flowers were planted in color groups, so the plants grow in both wide and narrow stripes. Because the fields are hilly, those stripes seem to rise and fall, undulating across the landscape. It’s like someone spread a brightly colored quilt across acres of farmland, as if a score of rainbows have fallen to earth. Luckily, we had our cameras with us so we could share our discovery with you. Since that day, we’ve asked around about the flowers, and come to find out, most of the locals don’t even know the fields are there. Which makes the magic of finding them all the more wondrous. Finally we found an explanation. 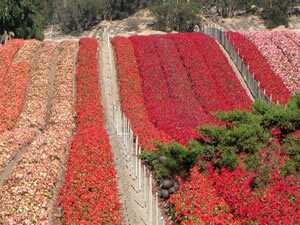 The flowers are planted, allowed to completely mature, and processed for seeds. 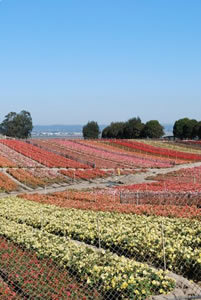 From what we were told, they plant about three or four fields a season, which explains why sometimes the fields on the way to the dump are ablaze with color and sometimes they’re just dun-gray earth.